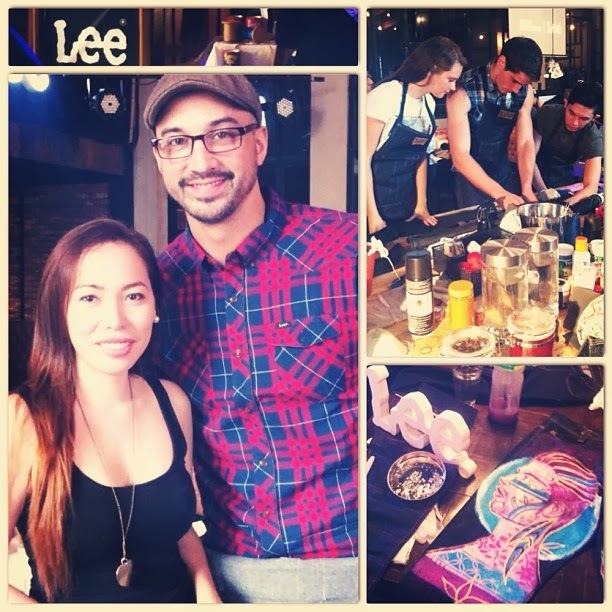 The iconic American Jeans brand has raised a call to arms among Manila’s fashionistas with a Denim DIY Craftsmanship Workshop at the hip URBN Bar that also kicks off the Lee Style Army Competition. Eight future fashion industry leaders and stylish celebrities were selected for their passion for denim and for being embodiments of Lee’s Stay Curious spirit: Sculptor-fashion designer Leeroy New, visual and tattoo artist Sarah Gaugler, designer and muralist Deejae Paeste, Pro-formula racers Michelle Bumgarner and Mark Bumgarner, designer Jerome Lorico, and fashion blogger and accessory designer Paul Jatayna. At the workshop, we were given the chance to discover the many possibilities of denim by customizing pieces that represent their personality and sense of style. Each piece were featured at the Lee Denim Exhibit during Philippine Fashion Week last Oct 25, 2013, 6 pm at the Atrium, SM Mall of Asia. Hosted by KC Montero, we had the opportunity to create jeans that we can truly call our own, and become modern artisans reliving the spirit of denim craftsmanship, which Lee has inspired for more than a hundred years. With Lee’s landmark 125th anniversary fast approaching, versatility and universal appeal of the denim were featured at 4 work stations where we experienced fading, staining, whiskering, patching, grinding, and embellishing a piece of Lee original zip-fly jeans. "We need that feeling, the emotion and personal expression that for a brand like ours, is critically expressed through the fabric. Denim is intriguing and unique in that it can truly reflect the personality of the wearer - the little scrapes, scuff, tears and frays, the way it gets better with ages and over time becomes part of the person it clothes,” Lee EMEA Head of Design Gerald Bultot explained. Through the workshop, Lee celebrates the spirit of craftsmanship by inviting fashion students and aspiring design professionals to learn about denim culture and discover their creative potential. True to its Stay Curious campaign, the legendary brand continues to ignite the passions of individuals, inspiring them to look beyond the ordinary, take a step into the unexplored and live out their dreams through fashion.